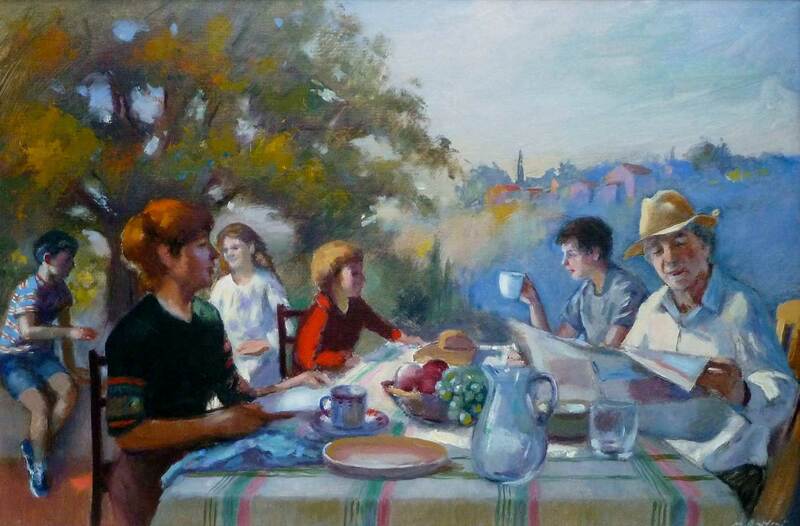 The Royal Institute of Oil Painters Annual Exhibition 2018 reveals a common interest among contemporary oil painters in portraying mealtime scenes. As cultural shifts lead people away from regular sit-down meals with family, it’s fascinating to see how these trends are reflected in our exhibition artworks. Several exhibitors portray the anonymity of the worker’s lunch break. Others focus on the intimacy and scope for humour within the age-old ritual of family feasting. Mall Galleries' Digital Content Creator Beatrice Bowles-Bray went behind the scenes to find out more about the paintings from the artists. 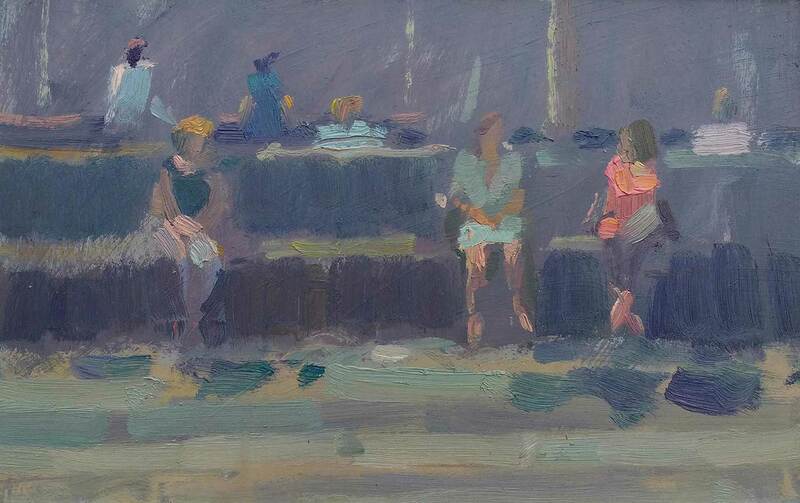 In contrast to these scenes of diners dwarfed by the magnitude of their built environment, other works of art in the ROI Annual Exhibition 2018 look back to the tradition of families eating together. 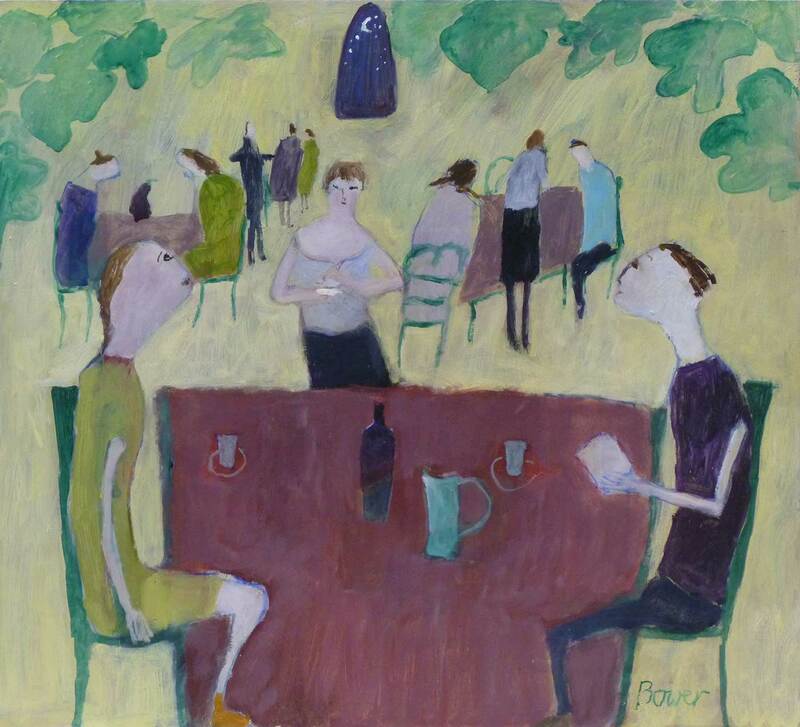 ‘I frequently paint people eating and drinking, often with my pets looking on’, says Susan Bower RBA ROI. ‘I have four children and six grandchildren and seem to spend a lot of my time cooking for them all!’ Fish Supper reflects Susan’s love of seafood. ‘Living in Yorkshire near to the east coast we have access to wonderful fish and have had countless fish suppers over the years’, she says. Susan’s mealtime scenes are often inflected with humour. Going Vegan comically touches upon the tricky topic of special dietary requirements. ‘My daughter is a staunch vegetarian but my husband is a dedicated carnivore’, she says, which no doubt makes life around the dinner table complicated. ‘I’m just relieved Georgie didn’t go Vegan’, she adds. Susan’s minimalist composition allows the viewer to imagine the bemusement on the faces of the waiter and diners, the empty table an indication of their struggle to find vegan options on the menu. 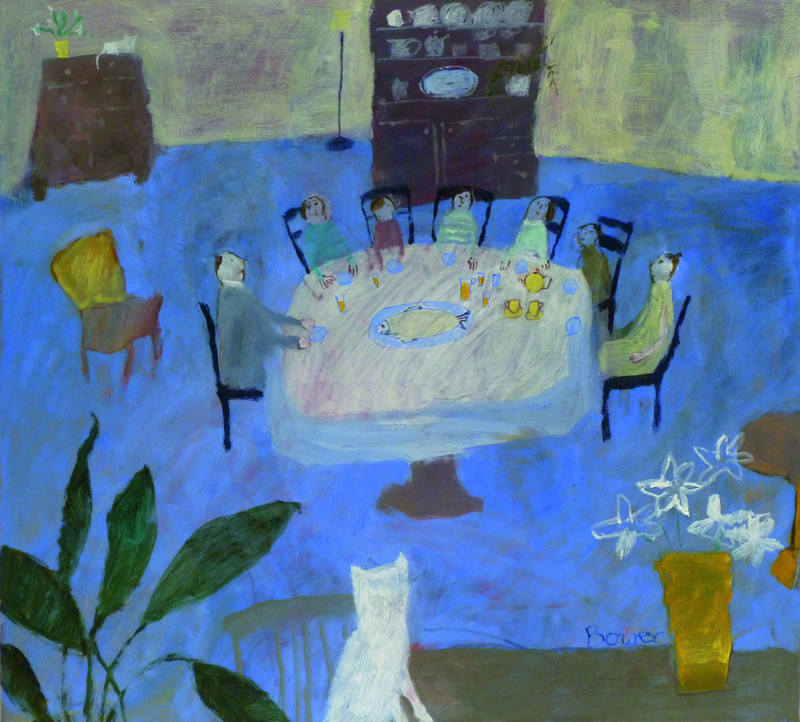 Although these paintings present the act of eating in different styles and from different perspectives, each recognises that, at a basic level, eating is an opportunity to engage with the wider world. That could mean sharing our space with strangers or demonstrating the world’s largeness by our comparative smallness. It could also signify the special shrinkage that occurs when a family dining room comes to feel like the whole world. Discover the exhibition online now to see how other artists have touched on the theme of food and more. 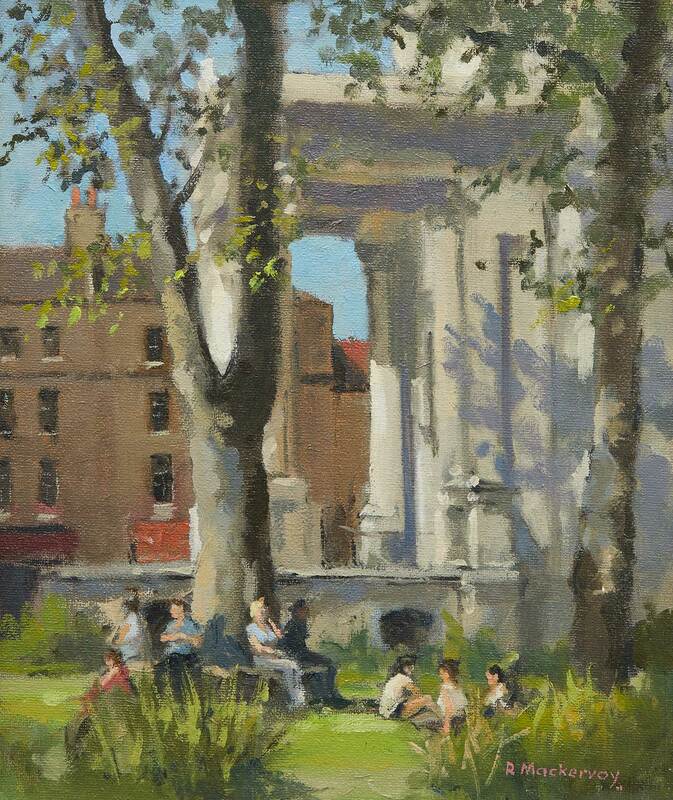 The ROI Annual Exhibition is open at Mall Galleries from 28 November to 9 December 2018. 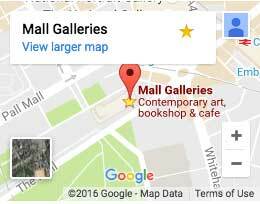 To purchase a work of art contact info@mallgalleries.com or call 020 7930 6844. Submitted 5 months 5 days ago by Beatrice.